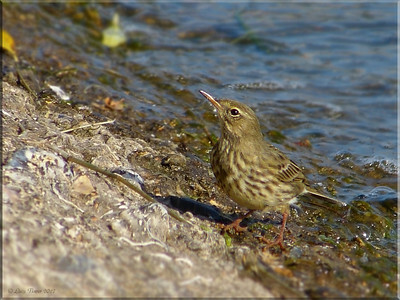 Rock Pipit (Anthus petrosus), Wilstone Reservoir, Nr Tring, Hertfordshire, 10/10/2012. 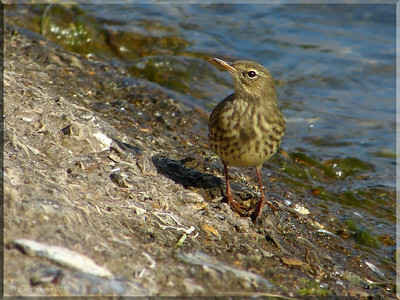 I spent a lovely, sunny hour or so observing and photographing this bird. 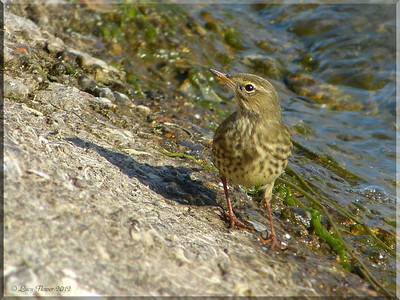 It fed voraciously and happily along the NW shore line, occasionally being flushed by walkers/dogs. 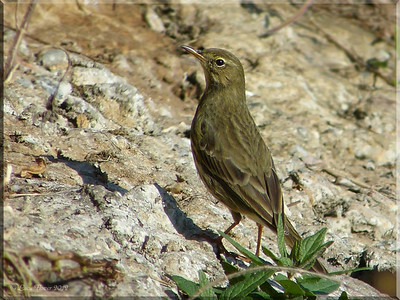 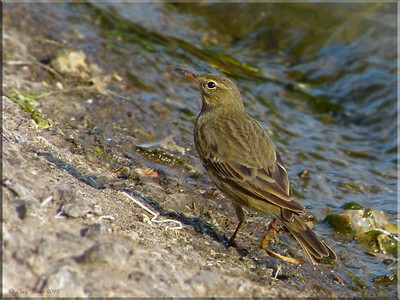 As a more knowledgable friend pointed out, it had markedly lighter leg colour than on average and was at the low end of range of Rock Pipit size/bulkiness i.e. 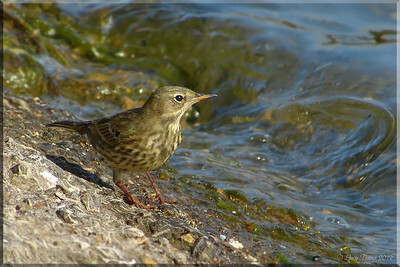 it actually reminded me more of a Water Pipit in terms of its sleekness. 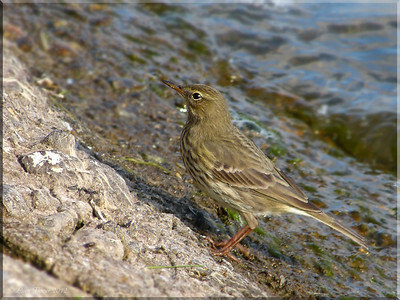 Rock Pipit (Anthus petrosus), Wilstone Reservoir, Nr Tring, Hertfordshire, 10/10/2012. 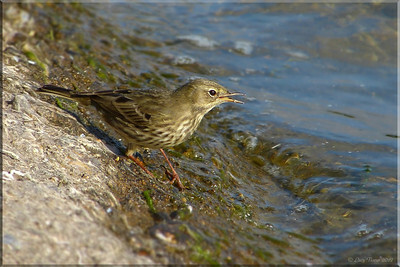 Rock Pipit (Anthus petrosus), Wilstone Reservoir, Nr Tring, Hertfordshire, 10/10/2012. 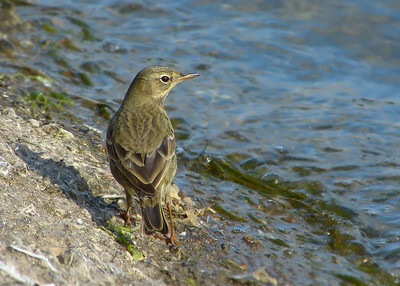 A full profile view of the bird. 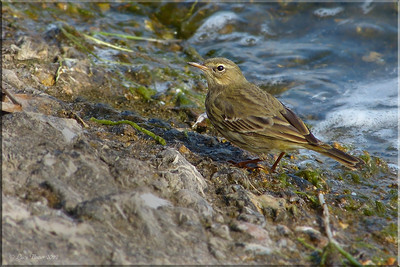 Rock Pipit (Anthus petrosus), Wilstone Reservoir, Nr Tring, Hertfordshire, 10/10/2012. 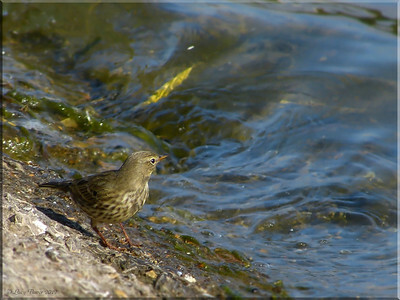 The gently lapping waters of the reservoir look a lot more perilous when you're the size of a pipit!